If you want to gamble, this is not THAT kind of Casino. 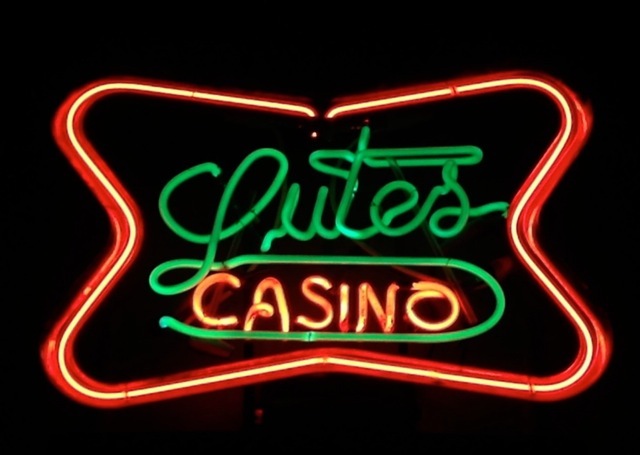 Lutes Casino Restaurant is a fun historic destination in Old Town Yuma that appeals to both locals and Snowbirds who are looking for a casual dining experience with lots and lots of memorabilia covering every surface in the place. Located in the heart of Historic Downtown Yuma, Jimmy and I were taken there by RV friends on a warm afternoon for a cold drink. While the place might look a little rough when you first enter, it's not. This is actually "a place for young and old,” says Bobby Lutes, co-owner of the Casino with his brother, Billy. The building dates back to 1901 and has functioned as a store, hotel and billiards hall. Lutes took ownership in 1959 and "started collecting the wall stuff in about 1960,” he recalls. Do not be in a hurry when you visit. The food service can be slow. Take this time to walk around and check out the hundreds of fading posters and photographs. The menu is mostly average American bar food. Prices are reasonable. Pint of craft beer was $5. - Plenty of parking in the back (on Maiden Lane). RVs welcome. Great place! My experience dates back to the 60's. I bet the place hasn't changed much since you were there. Dogs are welcome on the back patio too. Great information about furry friends.